However, the treatments responsible for higher survival rates in childhood cancer can also lead to adverse long-term health outcomes, referred to as late effects. The most common late effects include growth and development, organ function, reproductive capacity, secondary cancers and psychological disorders. Unfortunately, many cancer survivors don’t know about these risks. But with funding from Hyundai Hope on Wheels, Akron Children’s Hospital developed an online tool to give these childhood cancer survivors the resources they need to understand and manage their late effects. Through CancerLateFX, a free, personalized app and website, childhood cancer survivors can receive educational information, tips, tools and resources to keep them informed and healthy throughout their adult lives. 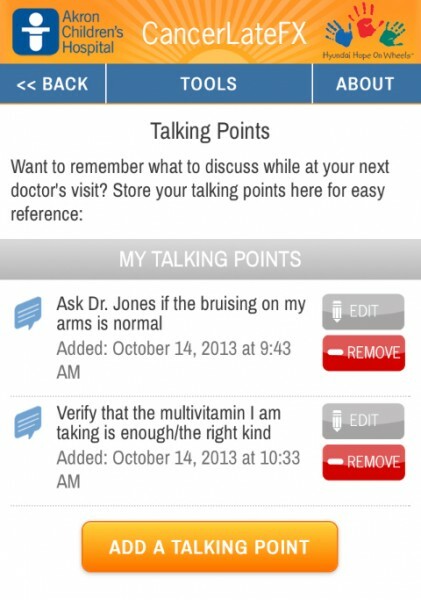 Here’s an example of one of the mobile app tools that helps you remember questions to ask your doctor. The app generates content based on a person’s symptoms and medical history. It also uses the survivor’s cancer type and specific medications/treatments to introduce goals, prevention tips and talking points that can be further explored with the user’s current healthcare provider. For more information, visit www.CancerLateEffects.org or download the app from iTunes or Google Play.